There's no dust settling on Neil Claridge, Manager of Plant and Fleet Services for Caboolture Shire Council, despite his 42 years in the public works industry. "For many years, and up until recently," said Neil, "we used brooms to clean our Council. I'm not talking about machines, either, but a man with a broom. He'd sweep debris into little heaps on the pavement. Then, someone would come along on a tractor, shovel it in, and away they'd go. That was our standard procedure as recently as 10 to 15 years ago." 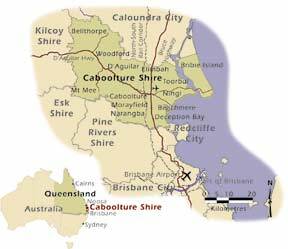 Caboolture Shire is an agency in the general vicinity of Brisbane, servicing approximately 125,000 residents. It's one of the few areas in Australia that can boast being home to an animal called a Dugong, also known as a Sea Cow. Caboolture residents are, in large part, composed of retirees and tourists, and the Dugong are one of the reasons -- along with the spectacular waterway location and scenery -- that tourists visit Caboolture with such enthusiasm and in such numbers. For the last several years, Caboolture Shire has used regenerative air sweepers and, I'm told, was one of the first municipalities to break away from traditional broom sweepers in favor of giving the 'new-to-Australia' regenerative air sweeping system a try. "Today," Claridge reports, "we sweep with regenerative air sweepers which, as far as I'm concerned, is the best system available. With broom sweepers, which we used until the last couple of years, the cracks in the pavement stayed full of material. In some ways, our streets were just as dirty after we swept as before we went through the process. Particularly when we are going to sealcoat a roadway, the regenerative air sweepers make all the difference. You just can't get a roadway ready for that with a broom sweeper." "When we bought our first regenerative air sweeper a couple years ago, we heard comments that these sweepers were only good for use on carparks and tarmac [flat roadways only], and they wouldn't do a good job where there were speed bumps or irregular road surfaces. We've found that's not true. The way these sweepers are built, and with their floating parts and adjustments and so forth, they do a good job on most any surface we use them on." "Regenerative air is the way to go these days, though they aren't the 'lazy man's sweeper' the old ones used to be. With the old machines, you'd just sit in the thing, put the brooms down, and go. With the regenerative machines, you have to adjust a bit as you go along, lightening up the suction or increasing it, depending upon the debris you need to sweep and the terrain. We've found that once we got the operators used to the regenerative air system, though, they have no problem whatsoever. We're more than happy with them and if I was in need of another sweeper today that's what I'd get again." "The regenerative air machines are also in the shop far less, although we haven't gotten to the stage where we can put exact figures to it. Even though we've had the two regenerative air sweepers for quite some time now, we've just started, as part of our plant operations, doing whole-of-life costing on our machinery. So, although we don't have hard figures on our previous sweepers [a Johnston 600 and a Scarab Major 5000], we're now getting them on our current air machines. Anecdotally, the regenerative air sweepers haven't been in the shop very often. With the other machines, I can recall continually asking the operators why they were in the shop all the time." 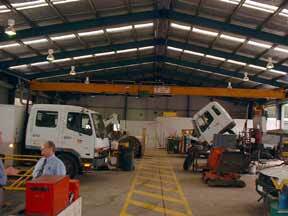 "Also, the suction, or pickup ability, is much more efficient with the regenerative air system. This is especially notable on Bribie Island where there's a large amount of sand and the like. Bribie Island used to get into all sorts of trouble whenever we'd get a heavy blow of wind, and all the leaves and other debris would clog up the drainage outlets. It was a real problem, one that required us to go in and do a lot of handwork to clean them out again. Now, we don't have to do near the handwork we used to. In the old days, as soon as there was a blow, we'd have to spend several days over there to do the cleanup. Since we've been using these regenerative air sweepers, it's being kept much cleaner. If we get a blow now, we only need a couple of hours of handwork, which is a huge difference and a big savings for us." "Anything else about your Council that sets you apart," I asked, " or might be of interest to our readers?" "Well," said Claridge, "we're involved in a program or two we're proud of. The way our government works, we can't give money to any kind of cause in the community, no matter how worthy. 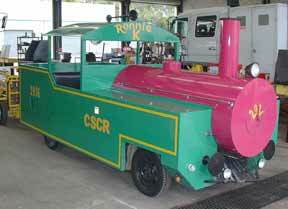 So, awhile back, I proposed an idea to Council that we build a miniature children's train, one that would travel on roadways. Then, we'd offer it free of charge to organizations in our municipality. We have now built the train, which has an engine and four carriages, and we designed it to be 'disabled friendly' to accomodate wheelchairs. It will take about 50 people at a time for a ride. We give it free of charge, no fuel costs even, and we even deliver it on our tilt truck to basically anywhere in the Shire. The organizations use it as a fund-raiser in pretty much any way they'd like, though hopefully to give kids rides at a very low cost." "We used a Toyota Corolla chassis from a derelict that got left on the side of the road, and the boys in the workshop built her. Generally, the groups that use the train are the schools and our service clubs like Rotary and Lions and church organizations. 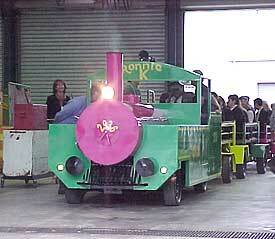 It's also used for rides for the disabled, and for the Family Days that are held in our park. Just about every weekend, the train is out for use." "Our next project -- one we were featured on television for -- is that we managed to locate and retrieve a 1939 Caterpillar grader. 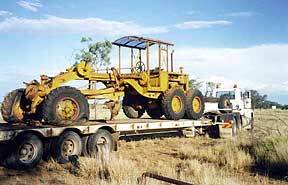 Its serial number is 55, and it was abandoned on a cattle station about 1500 km from here. We brought it back and my apprentices are restoring it to new condition. It was fun to see the look on the cameraman's face when the apprentice pulled the rope on the engine -- it's a rope start that operates on a magneto system -- and the engine fired right off. The old girl pretty much started right up without us doing anything to it, really, even after sitting for so long. 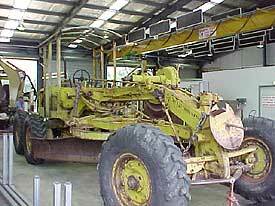 I'm hoping to get Caterpillar to agree to have a pulling contest, one that pits their new model against this one, when we get done restoring it. I think we may just win." "Environmentally speaking, we believe everyone in our community should be aware that everything that gets dropped on the ground is eventually going to end up in our creek or in our other waterways. That includes dust and the whole lot. In fact, we feel so strongly about this, that both of our sweepers have environmental symbols painted onto them. The Dugongs feed on the sea grasses that grow up and down our coast. They are a strong natural attraction for our area. 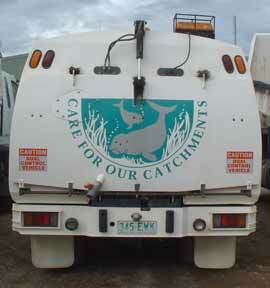 We painted a graphic featuring the Dugongs onto one of our sweepers, along with the caption 'We All Live Here!' We also have a water concern, due to the dryness of the Australian continent. We actually have to buy a lot of our water from other councils in Brisbane, so we have that concept as the mural on the side of our second Schwarze sweeper." "We also have a new policy in our government system. It requires each Council to work its costs out, as if we were all contractors. We had something called the Hilmer National Competition Policy Report that came into force about six years ago. The report encouraged local governments to assess their structures, and to become competitive in the services they provide. This new era is an offshoot of that report. We're now supposed to be a business unit of Council." "I'm attending a business meeting this week with the person in charge of the traffic branch of our police department. 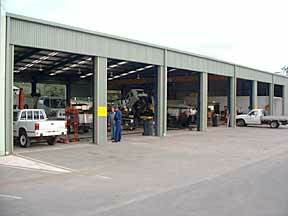 I'll be proposing that we start servicing the regional police cars here in our shop. I put in a competitive bid to do that, and it was one I had to develop in such a way as to not put any of the local businesses at a disadvantage. [The rules were that] I had to include all my costs in my bid: my overhead, telephone, rents, even my cost of funds. It couldn't be 'we've got the facilities and time, let's do your service here.' "
"Our bid was done so that we competed legitimately and competitively, with the others putting in a bid. And, everything we do now has to be done that way with full cost accounting. This process has made us look at our operation differently, and we operate it in a business-like manner in every way we can. We don't pretend that since we already have it [some aspect of our facility], it doesn't cost us anything." "Another program we feel is quite successful is that for the past five years we've introduced what we call a 'Council Driving Licence.' When it comes to one of our workers driving on the job, it doesn't matter what the state says they can do, but rather what we say they can do. This decision is based on a person's on-the-job driving, and related performance. Someone may have a semi-truck operators' license, but when they work for us, it comes down to what the two supervisors in charge of assessment under that program decide that a worker is qualified to operate." "Basically, an employee must be deemed able to look after and maintain a particular piece of equipment the way we want it kept, it's not just that the worker has the ability to drive it. We also have a point system for infractions in what might be called our 'code.' If someone loses seven points within a two-year period, they can't drive or operate a Council vehicle. Points are lost based upon performance on the job. For example, three points are lost if you have an accident that's your fault, less if it wasn't your fault, and so forth. Smoking in a vehicle costs three points, and if a person doesn't look after their vehicle and keep it cleaned and washed, they lose points. If they have an accident and don't report it to us within 48 hours, unless they are dying in the hospital, they lose points. There are numerous ways to lose points, and this program has now been a resolution in Council. Some of our top people have lost points and some have even been fined." "How about you?" I asked, "Have you lost any points yet?" "No," said Neil with a deep laugh, tongue firmly in cheek, "though I've been sweating it. I have a deal with the local panel-beater, and if anything happens with my vehicle, he'll drop everything and fix it immediately so I won't have to worry about the 48 hours. That way my vehicle will be back in circulation immediately." "How about noise from sweepers?" I asked. "We just came from Japan, and with their huge population density, sweeper noise is a front row problem. Is that a concern in Australia?" "It is here, too. We have a lot of environmental controls in that regard. For example, we're not allowed to start sweeping too early on Sunday. Because of our waterside location, we have many retired residents and tourists, both of whom like to sleep in. However, we have had only one complaint as far as I know -- and that was from a man who complains about everything -- since we've had the new sweepers. Other than that, we haven't had any substantive complaints since we've owned the regenerative air sweepers. We start as early as 4 AM, and there's been no complaint on either of our two sweepers. Neil Claridge was a very enjoyable, knowledgable interviewee. Straightforward, articulate, experienced, and with just the right amount of crustiness, Neil came off as being both a teacher and a learner. He is a man who has cultivated the ability to keep thinking 'outside the box,' to the betterment of his Council and the people of his Shire. He asked questions about how things are done in America and, when the topic touched on debris screening, asked to be put in contact with someone in the United States with experience in that area. Claridge is no-nonsense, yet hospitable; busy, yet willing to take time to proudly show off the accomplishments of the facility he operates. He gives credit to the people working under him, and was greeted warmly by the workers we encountered throughout the facility. Meeting and interviewing Neil Claridge was a treat. As is said in Australia, Neil, "Good on you, mate!" This in-person interview by our editor, Ranger Kidwell-Ross, was held in June of 2001.